Many of us grew up playing with LEGOs and even today there are many children who enjoy playing with these fascinating pieces. But did you know that they can smartly be used as inspiration for an outstanding birthday party? 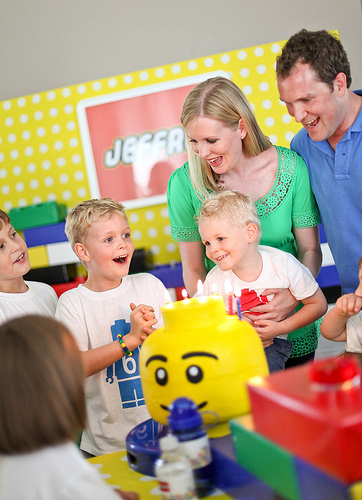 LEGO is made by a Danish company that also owns several LEGO parks all over the world. The name LEGO comes from the Danish language and means “play well”. Americans are LEGO’s greatest fans and that’s not hard to figure out why. Americans love design and American design’s role in building things how we know them today is major. So how about stimulating you children to become architects, engineers, or simply more creative people by throwing a LEGO party? Lego is made in bright primary colors, so it is very attractive to children. That makes it easier throw a party! Let’s take advantage of it and let us show you how! Never think you’re going too far when throwing a birthday party for the kids. Embrace your children’s feelings. They are usually far ahead of you when it comes to fantasizing. Believe us! Start with basic white, since that’s what all artists do. Paint or patch LEGO themes, then go ahead fill cups or containers with LEGO. M&M’s go great with this theme. Go crazy! Have no fear, moms and dads! 2. LEGO Candies, why not? We love to ask ourselves: Why Not? So why not LEGO candies? They would be cool to make for ourselves, so why not for our children's party? 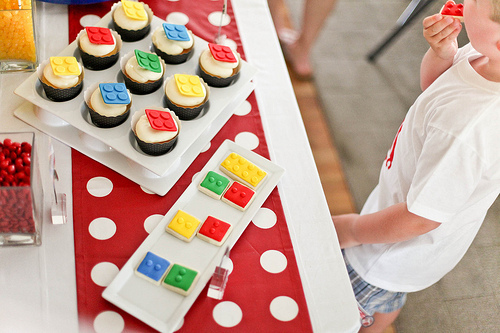 LEGO candies are just one of the many creative ideas you can embrace for your kids birthday. 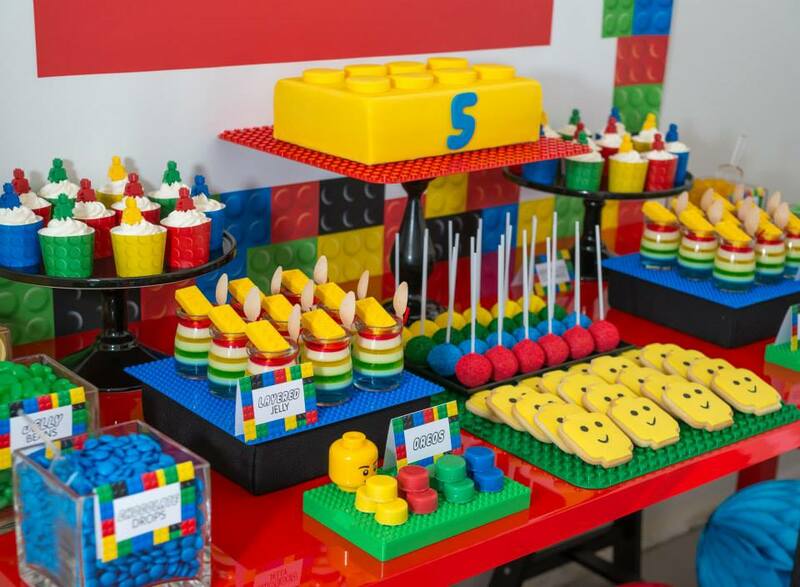 Sweets are a must have for any child’s birthday party. 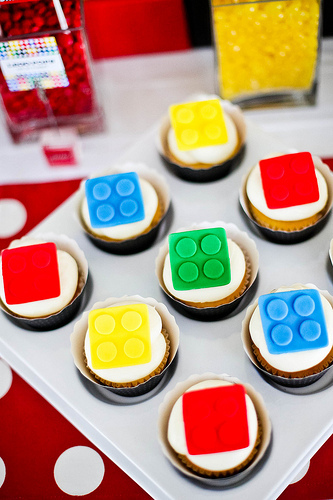 They can become fondant cupcake covering or you can make lego cookies. Why not? 3. LEGO-label stuff, like the drinks. First of all we stand for children drinking water. Or juice at the most, if it’s natural. 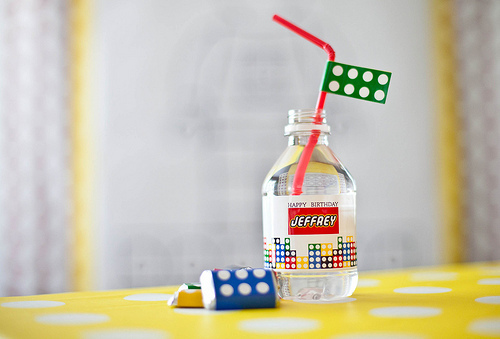 So continue with the LEGO theme and label the water bottles to look like LEGO pieces. It sounds like a good idea to relate good habits with fun. Right? It’s funny how when you are going to talk about the cake, a serious tone is employed. That’s because the cake is the protagonist! He is the main character in our LEGO script . So there’s no arguing here, there definitely needs to be a LEGO cake and we’ve just taught you how to make it (in case you haven’t clicked on the link before yet). The details make the party. Image Source: Pequenada. Details create the big picture. That’s a major guideline for the art of living and art in general. But let us not get too philosophical and back to the party. Print LEGO on whatever you can or feel like. Streamers are great. Also, create a LEGO photo corner. People love photos and they can’t get enough of it. Give them an excuse and a theme and they’ll go crazy for it. The more colorful the photos, the greater they look. 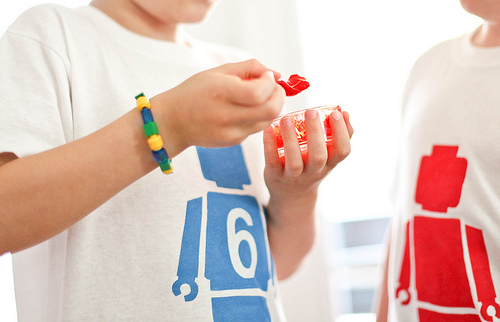 Making LEGO themed T-shirts not only will add a sense of belonging to your guests but it’s also great for parents who are on the rush. T-shirts also work as party souvenirs so you don’t have to worry about them. 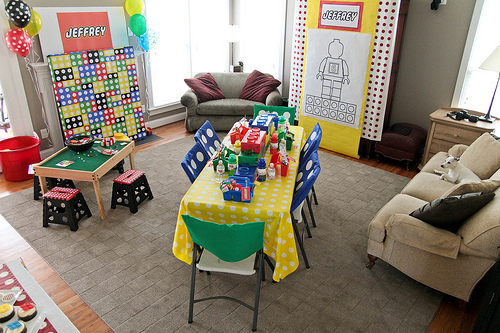 We are sure children will love a LEGO themed party and will have it in their memories until...well, maybe until the next party. We can only guarantee that they will have much much fun, and that it will be unforgettable for you and the beloved ones.